Visitors have accessed this post 20527 times. First you will have to download & install the Android Development IDE (Android Studio or Eclipse). Android Studio is an open source development feel free to develop your things. 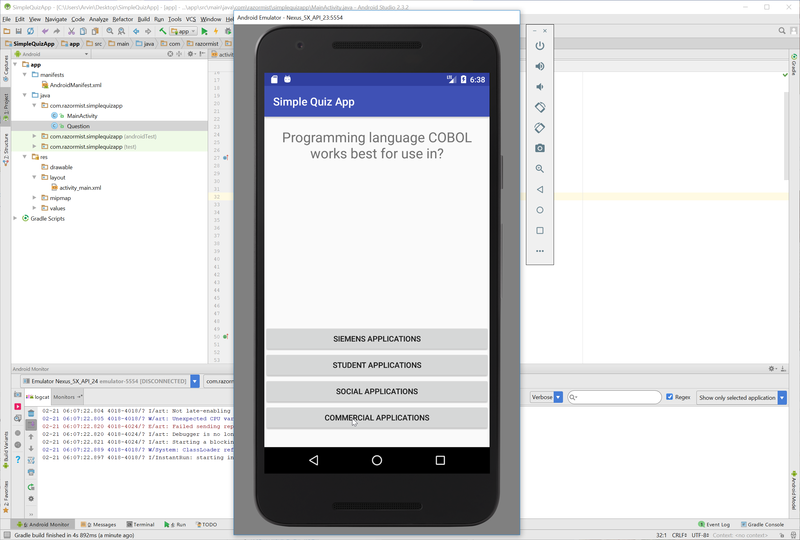 Here's the link for the Android Studio https://developer.android.com/studio/index.html. We will now create the design for the application, first locate the layout file called activity_main.xml, this is the default name when create a new activity. Then write these codes inside your layout file. The Android Manifest file provides essential information about your app to the Android system in which the system must required before running the code. It describe the overall information about the application. It contains some libraries that needed to access the several method within the app. This code contains the list of all questionnaire within the quiz app. To do that simple create a new java file namely Questionnaire then write these blocks of code inside the newly created java file class. "Programming language COBOL works best for use in?" This code contains the main function of the application. This code will automatically generate a random question every time the answer is correct. To start with first locate your MainActivity java file and open it, then write this variable inside the MainActivity class. Then write these method to make to code work correctly. Finally, initialize the require methods inside the onCreate method to run the application. Try to run the app and see if it worked. There you have it we have created a Simple Quiz App using Android. I hope that this tutorial help you to what you are looking for. For more updates and tutorials just kindly visit this site. Enjoy Coding!!! Hello, i applied this code it is very simple and sufficient for any type of quiz process. After initialization one can modify it as per his/her requirement by easy way. Thanks for awesome code !! "Then add this handler as implement to the MainActivity class, this will listened to all button function within the activity"
The part that you mean is that you need to add the implements View.OnClickListener in the MainActivity Class to be able to call the buttons via methods. This is where you put the implements. The last part of the code. Where to add it. I haven't seen a onCreate method earlier in the code. Am I doing something wrong? The onCreate method is located in the MainActivity,java. That is where you should put the last part of the code. Can I edit few features if we got source code clone? if so then how? thanks!